OAKLAND, Calif. (KGO) -- The fire at the Ghost Ship art collective warehouse in Oakland's Fruitvale neighborhood late Friday has now claimed the lives of 36 people. The Alameda County Coroner's Bureau has established a Family Assistance Center off Miller Avenue and 12th Street in Oakland. There will be grief counseling and resources available to those affected by this tragedy. If you are trying to locate a loved one or need information, please call 510-382-3000 for information. Facebook's safety check has also been enabled: Click here to find out if people in the area are safe. A Facebook page has been set up to help locate people who are unaccounted for. You can also follow the Alameda County Sheriff's Office and the Oakland Police Department on Twitter for updates. This YouCaring page has been set up for the victims and families of those affected by this fire. The Warriors, Raiders, and Athletics are also teaming up to match donations. There is also a spreadsheet on Facebook where people have been leaving descriptions of missing loved ones and updates on whether they are missing or have been located. 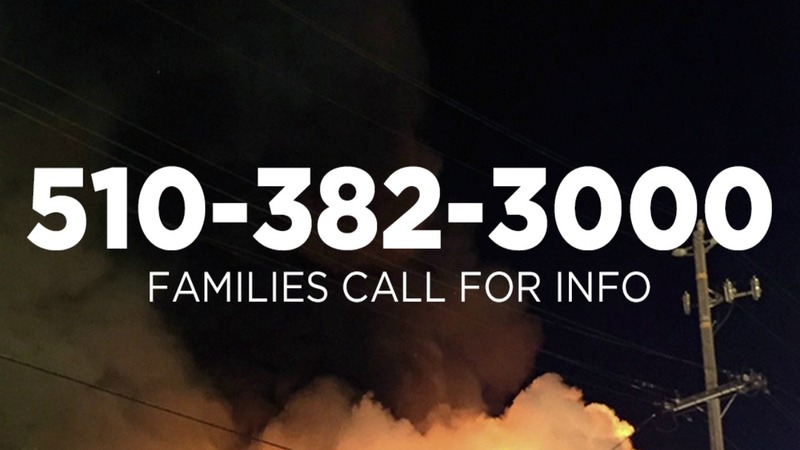 The Disaster Distress Helpline 1-800-985-5990 can provide immediate counseling to anyone who may need help in dealing with the problems caused by the massive fire in Oakland. The Medical Director for Alameda County Behavioral Health says perhaps half of the missing people had ties to the local queer community. In response to the crisis, the Pacific Center for Human Growth will have an ongoing, no cost, grief and trauma support group every Saturday at 11 a.m. starting December 12, which will continue throughout 2017. The location is 2712 Telegraph Ave., Berkeley, CA. For questions, call 510-501-6535. Licensed therapists who want to help at the official family support center are asked to contact Lewing@pacificcenter.org. Click here for full coverage on the Ghost Ship warehouse fire.